ASPEN SUMMER SOLSTICE PARTY – STARS, STORIES, AND ICE CREAM! 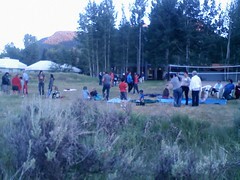 The crowd was eager, the ice cream was cold, and the stories were, well… spellbinding at the Summer Solstice 2012 party hosted by the Aspen Center for Physics in cooperation with the Aspen Science Center and Spellbinders Storytellers! Last Wednesday, the Aspen Center for Physics was the scene for some entertaining amateur astronomy and summer fun as the Center celebrated 50 years of physics in Aspen by co-hosting an evening of stellar storytelling, interesting related cosmic facts from Center physicists, and of course ice cream. Telescopes were also set up on the site. We joined the eager crowd, comprised mostly of families with children, in order to learn a little bit more about the lore of the cosmos. I felt like a kid myself – giddy with anticipation of the activities to come. While we waited for darkness to fall, our hosts brought out the some treats – cookies and ice cream. 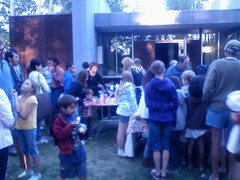 The liquid nitrogen-cooled creation was smooth and tasty, very cold, and very popular with this particular crowd. The kids seemed to like it too! As darkness began to fall, we settled in at one of the Spellbinders story stations to listen to some cosmic yarns. The storytellers wove tales about the Pleiades, the Big Dipper, and the origin of the Milky Way as seen in our night skies. Visiting astrophysicists then answered questions and doled out interesting facts about the cosmos. We, however, were treated to different rendition of the tale based on an Onondaga Nation (a Native American/First Nations people and one of the five founding nations of the Iroquois League) where the Pleiades represent “The Children Who Danced Into the Sky”. Apparently, several children of the Onondaga danced so much, against the warnings of their elders, that they rose off of the ground, higher and higher, until they found themselves in the sky and became the seven stars of the Pleiades star cluster. Although many versions of its origin exist, our Spellbinders story of the Milky Way followed the thread that, according to some ancient cultures, what we see as the broad, dim band of light in the night skies is a result of a greedy man who needed straw, stole a load from his neighbor, and flew his cart into the sky to hide. He flew so quickly that straw flew from his cart across the middle of the sky, marking his getaway path. There was a fourth Spellbinders story, but as it got dark enough to see the stars, and having learned our lesson at the ice cream battle stations, we decided to beat the crowd to see the planet, Saturn, through the telescopes that had been set up nearby. We saw the magnificent ringed planet, and although its bright image was a little bit smaller than I had hoped for, I could definitely see the rings – the first time for me! This was a fabulous, fun and entertaining public event put on by the Aspen Center for Physics, and I am looking forward to attending another one, a July 5th talk on “Big Science Questions” by former NASA mission specialist and current NASA Associate Administrator for Science, John Grunsfeld. Aspen Astronomy - Here's My Sign!